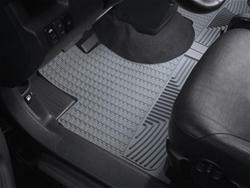 These WeatherTech AVM Trim-to-Fit floor mats offer excellent floor protection for car owners on a budget. These mats have deep sculpted reservoirs to trap water, road salt, mud, and sand. They feature a pliable rubber material that won't crack or harden in sub-zero weather and an anti-skid design to prevent shifting in your vehicle. WeatherTech AVM (All Vehicle Mats) floor mats are designed with indicated trim lines, allowing you to custom-fit them to virtually any car, truck, minivan, or SUV. When it comes to affordable, customizable floor protection, WeatherTech has you covered!